The words to the current Alma Mater were written by A. C. Corcoran, class of 1919, and was first printed in The Tiger on February 18, 1919. It had first been performed by the Glee Club in chapel on Monday morning, February 17. (The Tiger, "Alma Mater", February 18, 1919, Volume XIV, Number 16, page 1.) The Tiger observed that "It went good. Learn it!" The paper also advised the cadets that "when this song is played or sung at student gatherings or on other occasions; all will stand with heads uncovered." In the February 25 issue of The Tiger, Corcoran was thanked for his contribution. "AN APPRECIATION"
Clemson at last has an "Alma Mater" which she can sing in praise of her heroes. To the author of this song we wish to extend our hearty thanks and deepfelt appreciation. In this small way, we, the Corps of Cadets, endeavor to show him that we are glad that there is a man among us who has both genius and spirit and who is willing to use it for his college. The music was arranged by Dr. Hugh H. McGarity, who helped Robert Farmer, winner of Tiger Brotherhood's contest, put the tune to new music in 1949. The alma mater is sung at the beginning and end of every football game, several other sporting events, and at the end of graduation/commencement ceremonies. Though it has 4 full verses and a chorus, usually only the first verse and the chorus are sung. 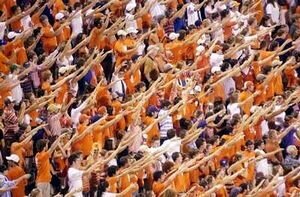 Traditionally, Clemson University students, alumni, and fans all raise their right arms straight out, and wave their hands, thumb in, back and forth during the alma mater for the last line of the chorus (most raise their hands between the last two lines). This tradition is a throwback to Clemson's days as a military college when cadets would wave their hats in a similar fashion. Swept by storm and gale. This page was last modified on 8 January 2010, at 12:18.